In this delightful new book by bestselling author Alexander McCall Smith, Hari is an ordinary boy living in India with an extraordinary talent. His special talent for dancing changes his life – and others too. 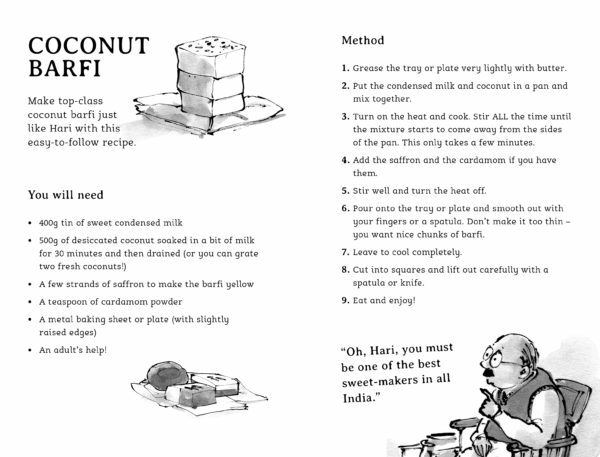 As the author says, ‘such is the power of dance to change our lives!’ Get a flavour of the book here and enjoy a recipe for delicious coconut barfi. Hari and His Electric Feet is about an ordinary boy with an extraordinary talent. Hari has an easy smile, a spring in his step and likes nothing more than watching – and learning from – his beloved Bollywood films. When Hari realises he has a special talent for dancing it changes his life – and the lives of lots of other people too. When Hari dances, other people can’t help but join in. And dancing together makes everyone happy! Hari and His Electric Feet by Alexander McCall Smith, illustrated by Sam Usher, is out now published by Barrington Stoke priced £6.99.